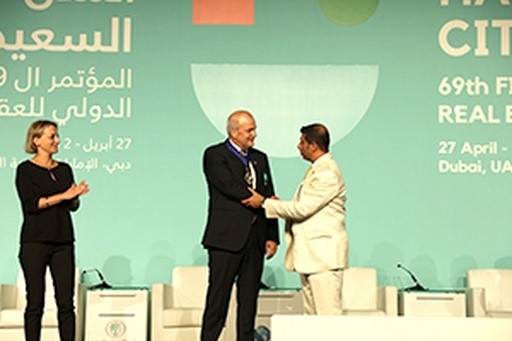 On May 2, in Dubai, Assen Makedonov was installed as FIABCI’s 53rd World President. As part of the traditional FIABCI World Congress closing ceremony, dating back nearly 70 years, the presidential inauguration celebrated the conclusion and achievements of Farook Mahmood’s mandate while looking to FIABCI’s future with the installation of Assen Makedonov, 53rd World President. As World President, Makedonov plans to build upon the strategic initiatives of the Vision 2020, put forth by his immediate predecessors, and lay the foundation for taking the organization to the next step by identifying core objectives to align with a Vision 2030 plan. Among the core goals for his presidency are to increase membership and form new national and regional chapters; to strengthen cooperation with allied world organizations such as the World Bank, International Monetary Fund and UN-Habitat; and to raise the profile of FIABCI through its newly enhanced website and member portal, www.fiabci.org. The website and Apps are still in development process and will be presented during the meeting of Board of Directors on September 15 in Sofia, Bulgaria. “Along with working to strengthen our standing and influence in the global real estate community, I will focus on providing FIABCI members with the services they need to do business worldwide,” said Makedonov. “Supporting our members’ business interests is a core part of FIABCI’s mission. I look forward to working with the FIABCI board, committee presidents and other FIABCI leaders to advance our members’ opportunities in the global property market. On May 17, representatives of many of Bulgaria’s governmental and non-governmental organizations came together in the Central Military Club to congratulate the newly installed FIABCI World President. Boyko Boykov, chairman of FIABCI-Bulgaria and President of the FIABCI World Council of Developers and Investors, presented Mr. Makedonov to the guests. Sofia’s chief architect Zdravko Zdravkov congratulated Mr. Makedonov for his election as president and presented his development plan for Sofia city. Mr. Makedonov also received congratulations on his inauguration from Mr. Lachezar Iskrov, Bulgarian Chamber of Commerce and Industry, Mr. Ivan Velkov, Chairman of the Bulgarian Facility Management Association and Deputy Chairperson at MCC (Metropolitan City Council), and Ms. Irena Perfanova, Chairperson of NREA (National Real Estate Association). Numerous other industry leaders and media representatives also were present to enjoy the reception, which included a live violin performance with the assistance of DJ Daniel Mark. Guests viewed a film portrait, premiered in Dubai, presenting Bulgaria as a tourist and investment destination along with President Makedonov’s development platform for the World Federation for his 2018-2019 tenure. In related media interviews, President Makedonov promoted the mission of FIABCI and encouraged participation in the FIABCI-Bulgaria Prix d’Excellence with the possibility of competing on the global stage during the FIABCI World Real Estate Congress in Moscow next May. President Makedonov is a partner of B&H Real Estate in Sofia, Bulgaria. He holds a master’s degree in economics and brings more than 30 years’ experience in the international trade, travel and real estate industries to the role of World President. He holds several internationally-recognized professional industry designations.